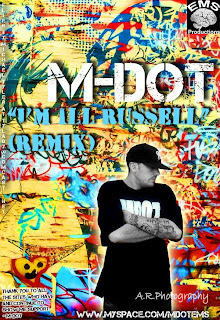 The Bostonian emcee and frequent collaborator Revalation hit me with this new M-Dot song called I'm ILL that showcases M-Dot's flow and delivery over a Red Cafe inspired track. The track concludes with the homie shouting out blogs and dot com's that have showed him love in the past (this blog is included woooooooo). The homie M-Dot has a lot in store for us before his debut album drops and you best believe I will keep you all updated with the latest and greatest. Hip hop shouts out to blogs? Yeeah!